You’re a parent on the go. Always on the road, traveling (or working) and basically just living the life. But your baby doesn’t want any of it. Your little angel (or angels) just want to sleep tight and head off to Slumber Land. For the jet-setting parent, a stroller is almost a necessity. However, finding the one can be a daunting task, so we’ve put together My Tiny Traveller – your one-stop-shop, exclusive guide for finding the best products for your baby on the move. And the best part is, we made it just for you! The first order of business before worrying about any of the other mobile products is to get mobile, you need the best travel system stroller. Never again will you scour the internet for the best car seat stroller combo reviews only to bang your head in frustration just because the best model from one review is the worst in another. A Travel System Stroller is a set that includes a stroller, an infant car seat, and a seat base for your car that allows you to snap in the car seat. Most stroller brands have some sort of travel system, some sell all of them as a combo and some sell the pieces individually. A working travel system is a must for all parents on the move (and sleeping infants) since you can just easily transfer your baby from stroller to car and vice-versa without actually removing your baby from the car seat. Here at My Tiny Traveller, we will review complete travel system packages, strollers, and their car seat attachments, car seats and bases, and lastly car seat carriers. We recommend going straight for a full stroller and not get a car seat carrier since you will need a stroller as your little ones get older anyway. The best baby travel system will have three parts that work perfectly together without any confusion or difficulty. Many of the car seat companies make their own car seat stroller combos. You should also consider that many stroller companies make attachments for their strollers that will work for many different types of car seats. The best car seat stroller combos can be just as good if not better than an all-in-one package. Infant Car Size. This should be your priority among other things – your baby will be the one sitting or lying on it so take your time choosing the best. True, this type stroller definitely adds a whole new level of convenience, but the infant car seat is what’s keeping your baby safe and sound inside your car. The best travel system strollers have infant seats that will fit inside your car; you want to avoid the bulky ones as much as possible so you can still fit a couple of other things or some more people in the back of your car. To narrow down your options, choose models with car seats that fit snugly in your vehicle. After that, look for several safety features such as the number of harness points and padding thickness. You should also check out if the car seat has passed U.S. safety standards. Safety. The best travel system strollers prioritize safety over any other feature. Look for car seats that passed U.S. Safety Standards. It’s a bonus if the infant car seat is side-impact tested and also features energy (or shock) absorbing paddings – this keeps baby safe and comfy. You should also look into infant body support in the head and neck area; a bonus if they’re detachable. Lastly, check for the strength, number of points, and how adjustable the harness is. Portability. The best travel systems shouldn’t be bulky due to one obvious reason: a hulking stroller might not fit in your trunk! There are also ones that have a “one-second, one-hand fold” feature so you might want to consider those types. All in all, you ought to look for a stroller that will not only secure your baby nicely and comfortably but will also fit on your trunk with room to spare. Enjoy-ability. An enjoyable stroller not only keeps your passenger happy but saves you from tantrums as well. There are a ton of features and add-ons that make the best travel system strollers enjoyable and comfortable. First and foremost, foam padding should be thick enough to keep your baby comfortable during a bumpy ride but thin enough so your baby doesn’t feel too hot from all the insulation. You should also consider getting one with an under basket or a storage area where you can stash toys and other baby paraphernalia your baby may need. There are also several ones that have air-filled rubber tires (or bicycle wheels) that ensure a smoother ride on almost any terrain. They are a bit expensive, but they are worth checking out. The best stroller car seat combo might be the car seat you already have with a great stroller and adapter. And cup holders. Definitely get a stroller with cup holders. Maneuverability. Maneuverability is definitely a must-have feature for any stroller. A lot of models have lockable swivel front wheels which make it easy to turn. When you are considering maneuverability the amount of wheels is very important. A 3-wheel stroller will work better as a jogger and will be able to turn easier and a 4-wheel stroller will be a little more stable. Style. So you have a system that is safe, portable, enjoyable, and maneuverable. But can you answer this question: are you ready to take that stroller for a ride? Nope, if it’s downright ugly. The best travel system strollers give you the confidence to stroll around any neighborhood. Style is obviously the last thing you should consider in choosing the best one, but it’s not bad to keep it in mind. There are various color schemes for girls and boys, but you can also find ones that fit for both sexes. There’s plenty of options to choose from so you’re never going to get out of style. If you’re thinking of getting a new travel system for your baby, there are a few things you should consider before making that purchase. There are numerous styles, colors, and configurations to choose from. Travel systems vary in price, so you can stay within a budget if needed. They include everything needed for an infant, including the car seat, base, and stroller, so you don’t need to purchase any separate pieces. When bought together, the car seat and stroller will be a perfect match. Most travel systems come with handy features, like trays for mom and baby, storage areas, one-hand folding, and reclining stroller seats. The stroller in the travel system will likely be able to hold children up to at least 40 lbs, and some may even go as high as 55 lbs, so you will be able to use it well past infancy. You can move the baby from the car seat to the stroller without disturbing them while they sleep. Some brands allow you to create your own travel system, even fitting pieces from two different brands, so you can choose what you like. Travel systems tend to be heavier than regular strollers sold on their own, due to all the extra features they come with. This makes it more difficult to lift them up or down stairs or into the trunk of a car. They are a bit bulkier than regular strollers, even when folded down. This affects their maneuverability in tighter spaces or around turns. Though they work great on smooth surfaces, most don’t ride smoothly or easily over rough patches, like gravel or cobblestones. Cheaper travel systems may skimp on the features, sacrificing quality for budget. When you buy a travel system, you may have done so because it is convenient, giving you everything you need to take your baby on the road, for a walk, or around town to run some errands. There are a few things to remember though, to make sure your baby is safe at all times. First, you should make sure you are installing everything correctly. All of the pieces included with your travel system have a purpose, so make sure every one is installed. You should also practice clipping your baby’s car seat into its base and stroller repeatedly before you even add the baby. This way, you’ll be an expert before trying to put the seat in place with the extra weight of the baby in there. Give the handle a small shake when you have it in the base or stroller, so you can be sure it is attached firmly and isn’t going to slide out once you get moving. If you’re buying new, the travel system should have a decent expiration date on the car seat, but you should check it to be sure. This goes double for used products. This way, you’ll know it is still in good condition, with all the latest safety features. You should also check for the Juvenile Products Manufacturers Association seal, so you know the car seat has passed the proper safety standards. Though you may be enjoying the peace and quiet, don’t let your baby sleep longer than 2 hours in a car seat. This can lead to flat spots on the head, can increase gastroesophageal reflux disease, or even stop them from breathing since they aren’t strong enough to lift their heads up. Check them often when they are asleep to prevent any of these issues. 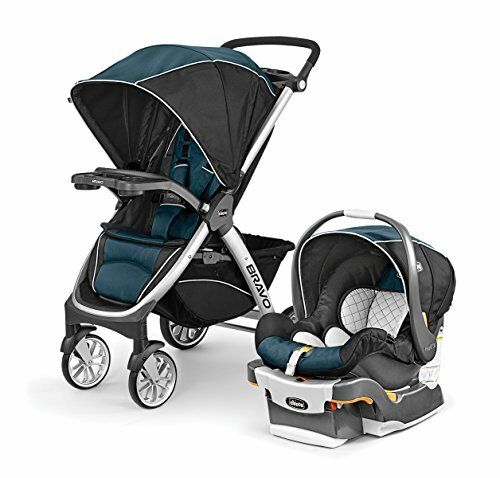 Graco‘s Comfy Cruiser Click Connect Travel System makes it simple to go on the road with baby. The included SnugRide Click Connect 30 Infant Car Seat is top-rated. It easily connects to the stroller safely with a quick attachment and in one step. One component that sets the Comfy Cruiser apart from other similar systems is the one-of-a-kind reversible body support that can go right from the infant seat to the stroller. Both seats provide a cozy ride as baby grows. 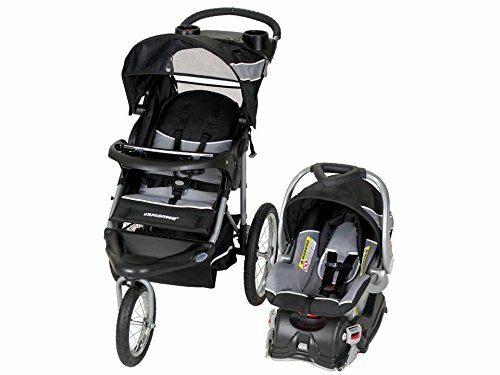 This stroller is lightweight and includes attributes like a one-hand fold, standing on its own when folded, and a parent’s tray with two cup-holders and some space for storing keys, a cell phone, or other small items. The Comfy Cruiser also has an extra-large storage basket. This would be a safe and comfy choice for your little one as well as a convenient choice for you. Check out this Graco travel system in action here! The Graco Modes is like three strollers in one, suitable for infants up through toddlers. It has the ability to transform into three different types of strollers with 10 seating arrangements. The first mode is as an infant car seat carrier. It includes the highly-rated SnugRide Click Connect 35 infant car seat. There are three different arrangements for this mode. The second way it can be used is as an infant stroller. The two different seating arrangements can allow the baby to face you or face out and watch the world go by. The seat can also recline to four positions. The third way this stroller can be used is as a toddler stroller. There are five options for how your child can sit when it’s being used with a toddler. The front wheels can lock, which is a handy feature for rough terrain. This stroller also has trays for the parent and the child. Weight Recommendations: Minimum-4 lbs, maximum-35 lbs. This Baby Trend system includes the three-wheel jogging stroller, and the Baby Trend Flex Lock infant car seat. It also comes with the lock in car seat base for use in your vehicle. The stroller features a lockable front swivel wheel for jogging. The wheels have all-terrain tires and a quick release for compact storage. The stroller has a parent tray for necessities, including two drinks. The child tray provides a place for baby’s cup and a toy or two. Other important items can be kept in the roomy storage basket. The wide handle is foam padded for comfort and the adjustable canopy adjusts to protect your little one from the sun and wind. The padded seat has an adjustable 5-point safety harness, tether strap, and can be reclined to several different positions. This Baby Trend folds easily and is lightweight. It can accommodate children who weigh as much as 50 pounds and whose height is 42 inches. The Flex Lock 30 infant car seat is designed for babies weighing between five and 30 pounds and are no longer than 30 inches tall. Keep in mind that the jogging function of the stroller is for when your child is older and is in the stroller seat only. Check out a video of the Baby Trend here! Weight Recommendations: Car seat – minimum is 5 lbs./maximum is 30 lbs. ; stroller maximum is 50 lbs. This travel system is designed with the jogger or all-terrain traveler in mind. It comes with the Flex Lock infant car seat as well as the base for use in the car. The front wheels can swivel or lock depending on what kind of terrain you’re on. The wheels feature air-filled tires and have a quick-release for storage. There are trays for the parent and the child and a large storage area, making it convenient to take all the necessities along. There is a five-point safety harness to keep baby snug as well as a rain and sun shade. The seat also reclines for sleepy little ones. It has a compact fold and it lightweight, making it easy to store or for traveling. The seat pads and insert can be removed for washing. It’s important to keep in mind that you should only walk when the infant car seat is in use and save the jogging for when your little one can ride in the regular seat. Weight and Height Recommendations: Infant seat 5-22 lbs. and up to 28.5 inches; Stroller birth to 50 lbs. and/or 42 inches. This lightweight Graco travel system comes with the best-selling SnugRide Click Connect 35 infant seat. Its light weight makes it easy to travel with, and it folds up quickly and easily. The stroller automatically locks when it’s folded up. It has a unique three-wheel design, so it’s easy to maneuver. Naps on the go are no problem with the stroller seat that can lay all the way flat as well as several other positions. You can bring along all the things you need with the large storage basket and the parent tray that also has a zippered storage area. Watch a video of the Graco Aire3 here. Weight Recommendations: Maximum for stroller is 50 lbs. ; Infant seat is 4-35 lbs. Peg Perego is well known for quality. This double stroller travel system is no different. While the market is sparse in this area, this would be a great option for anyone with twins or siblings who are close in age. 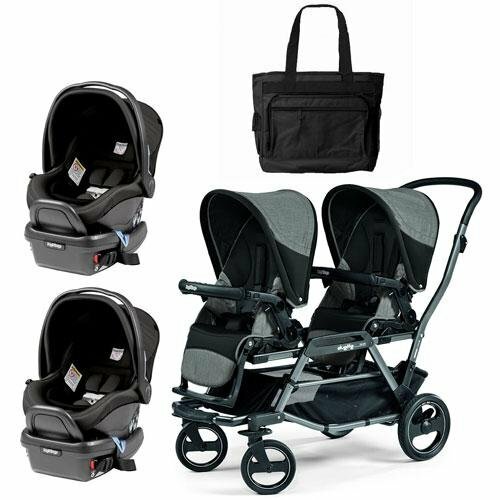 It includes two matching Peg Perego Primo Viaggio car seats and a diaper bag. Weight Recommendations: Infant seat minimum is 4 lbs. and maximum is 35 lbs. 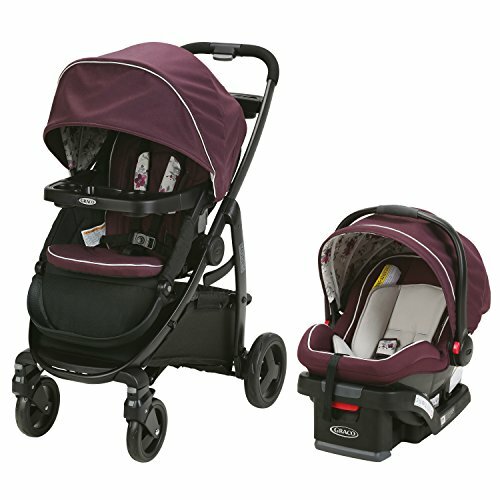 The Chicco Bravo Trio Travel System is an innovative stroller that can function in three modes. In the first mode, the stroller works as an infant car seat carrier. You simply have to remove the stroller seat, put the adapter on, and click in the carrier. The KeyFit (infant carrier) can still be used with the stroller seat attached as well. This function would be good for the in-between times when baby still fits in the carrier but could also sit in the regular stroller seat. When your child has outgrown the KeyFit carrier altogether, the Bravo functions as a normal stroller. This handy system also features a reclining seat and an extra-large sunshade. It folds easily with one hand and stands upright with wheels that automatically turn inward. The handle can be adjusted for varying heights and the storage basket can hold the essentials. Weight Recommendations: Minimum is 5 lbs. and maximum is 50 lbs. The Ultimate Convenience For You and Baby! Thank you for reading our article on the best travel system strollers. Here at My Tiny Traveller, we are focused on the baby on the move and a stroller is the first consideration. Without an easy and smooth way to get baby from car to stroller, your mobility is much less. The best car seat stroller combo will give you freedom. Take a look at all of our other baby on the move articles. If you liked what you learned on My Tiny Traveller and we helped you please click through one of the links and purchase a product from Amazon, we affiliate with Amazon to support this blog and keep it up and running. A simple click and purchase will give us a commission without any extra cost to you.